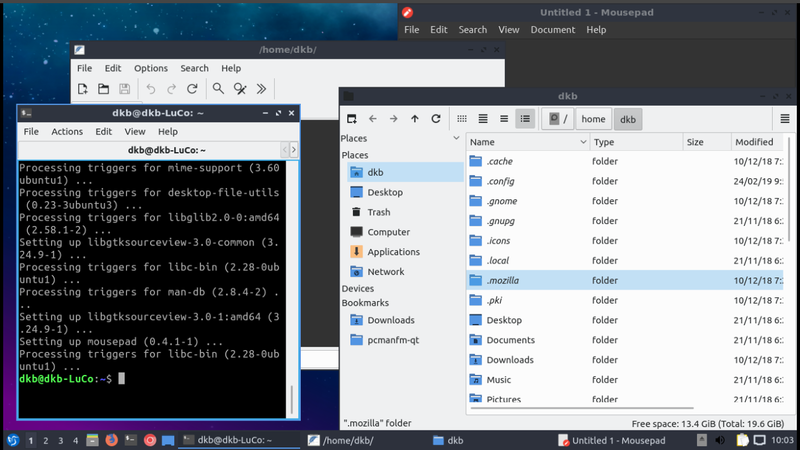 The default theme in Lubuntu has light themes (Bright and White), though I prefer a dark theme (With greyish and blackish background, and white text) as that kind of theme is good for my eyes (strains less!!). Therefore, I followed this link https://www.deviantart.com/satya164/art/elementary-Dark-GTK3-Theme-244257862 and tried to install it. E: The repository 'http://ppa.launchpad.net/satyajit-happy/themes/ubuntu cosmic Release' does not have a Release file. However, I'm getting the error says that it "Unable to locate package elementary-dark-theme"
I've also tried Changing the background color of the File-Manager but didn't work too. I would like to get black background and white/bright text on every application including File Manager. Please let me know how to accomplish this. Caution: at this stage of Lubuntu's move to LXQt, you can't completely get what you want with the available defaults! But the following suggestions may offer some relief! Lubuntu 18.10 has gtk3 applications and qt applications and uses Openbox as its window manager. These need to be addressed separately. 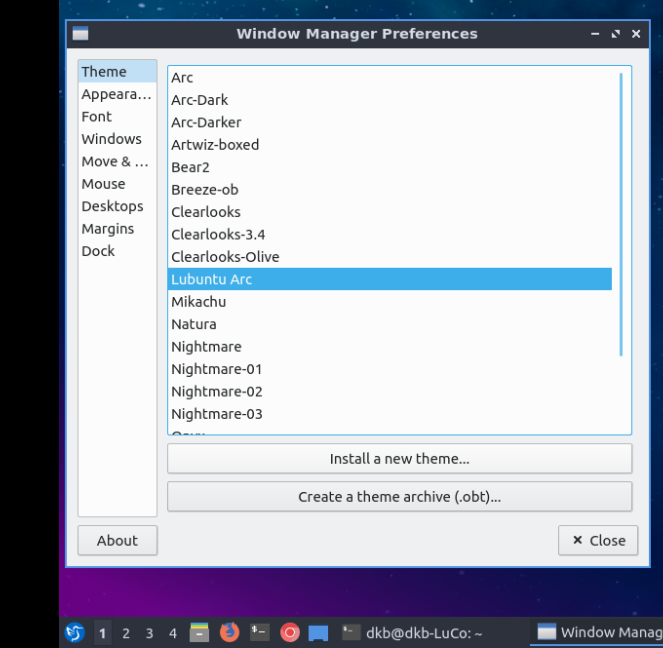 Lubuntu 18.10 comes with a variety of Openbox themes: some are "dark" with a dark background and light text and window buttons. To access the graphical user interface, click on the Menu button > Preferences > LXQt settings > Openbox settings > Theme. Move your mouse pointer to the pane on the right hand side and scroll up/down to select the theme of your choice. The appearance of the top bar dynamically changes to reflect the theme. I've chosen Lubuntu Arc. Clicking Close will enforce the selected theme. There some "dark" themes available in the repositories. So you don't really have to resort to ppas or external downloads. To illustrate, if you run sudo apt install blackbird-gtk-theme, that will install a dark theme suitable for both gtk2 and gtk3 applications. 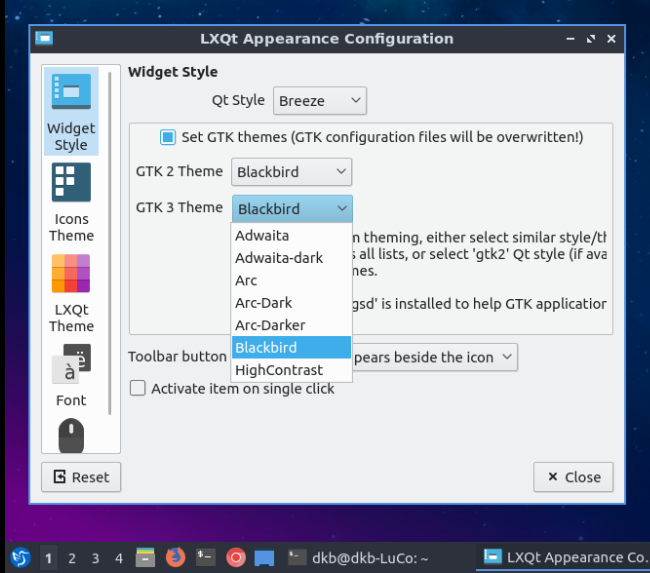 To select Blackbird as your choice for gtk2/gtk3 applications, again click on Menu > Preferences > LXQt settings and then click on Appearance. In the image below, I've chosen Blackbird for both gtk2 and gtk3 applications. This is a work-in-progress by the Lubuntu team. As above, click on Menu > Preferences > LXQt settings > Appearance. You'll notice that Qt Style does not offer a dark option at this time. Both Breeze and Fusion are "light" and Windows is probably something you don't want. The result of using Breeze or Fusion is that the area immediately below the application's window decorations and below the main window are light (and not what you want). The same graphical user interface can be used to select from a variety of panel themes. 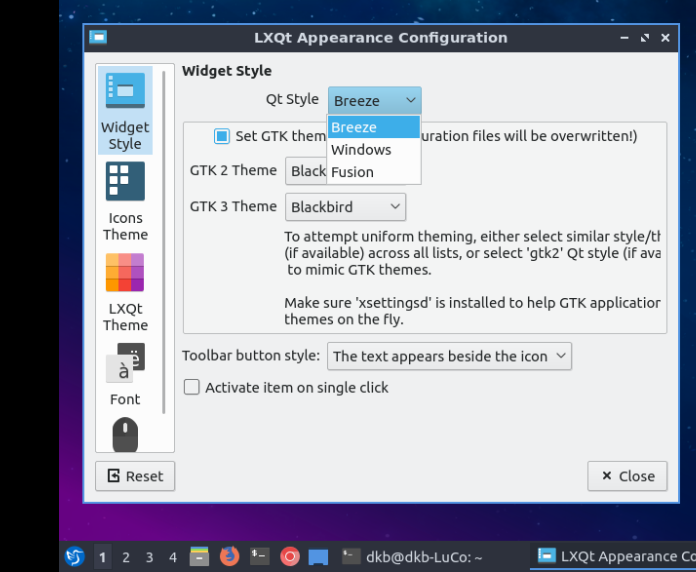 In Menu > Preferences > Appearance, click on LXQt Theme and make your selection. QTerminal and Featherpad both have a dark background with light text (other than the area themed by Qt Style). PCManFM-Qt is completely light with dark text. Mousepad, a gtk3 application, is completely dark with light text. It's quite possible that someone here knows how to get the appearance you desire but this is as far as I go! Not the answer you're looking for? 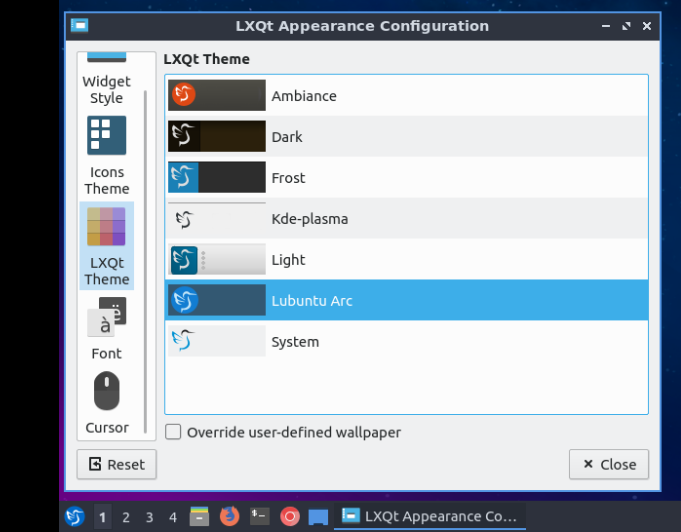 Browse other questions tagged lubuntu themes lxqt or ask your own question. Lubuntu 18.10 File Manager: How to view directory tree structure? high contrast inverse on ubuntu 13.10?